No need to go to a dealer for TRP replacement! Since 2008, Mercedes-Benz anti-theft policy has been in effect at Mercedes-Benz USA. This meant Theft-Relevant Parts (TRPs), which may require information from the vehicle owner to place an order for certain spare parts were only available at dealers. 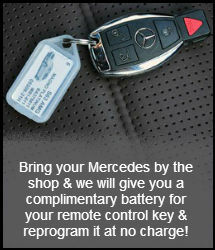 We can now handle all Mercedes Benz repairs as a Mercedes Certified service center and licensed locksmith. We have obtained this license for theft-relevant parts (TRP), including electronic keys, electronic ignition switches, infra-red and other locking control units. It is mandatory to have them installed at an authorized licensed Locksmith like G & N Motors or a Mercedes Benz dealer. With this license and our certification by Mercedes Benz for SCN coding, we can handle every type of Mercedes-Benz repair. We can now supply 722.9 valve bodies! You are not mandated to go to the dealer for valve body replacement. Airbag / SRS supplemental restraint system cables, etc. For 2004 and newer models, the Mercedes 7-speed transmission (also known as G-tronic) has an electronic control unit mounted inside the transmission. These control units fail frequently from speed sensor faults. The speed sensors are not replaceable and are integrated in the electrical conductor plate that bolts to the valve body inside the transmission. Replacing the valve body or the conductor plate does not mean removing the transmission as a valve body comes with the conductor plate / control unit. Early valve bodies must be replaced as a complete unit, but newer model units can be repaired by replacing only the conductor plate / control unit assembly. We have replaced many of these and are now certified for SCN coding to complete this repair. Mercedes-Benz was restricting sales of 722.9 valve bodies or conductor plate control units. These units were failing so frequently, that even dealers were restricted from selling them. Previously, Mercedes required the vehicles be brought into their dealers for any valve body or conductor plate repair, even if the vehicle was out of warranty and the customer was paying. The dealer was required to submit a request with paperwork and the factory would send the parts they felt were necessary for repair (either conductor plate assembly or complete valve body). 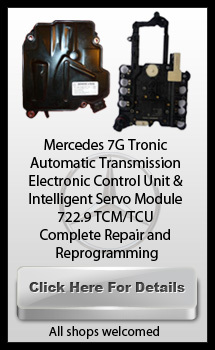 This has all changed and now we can take care of the complete repair and get the parts directly from Mercedes-Benz. You are no longer required to take your vehicle to the dealer for this replacement.